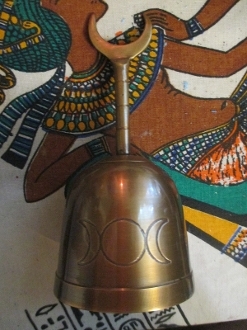 This stunning, 4.5 inche solid brass bell with triple moon is a perfect addition to any altar and sacred space. Bells represent air and water as well as the goddess. They are used to remove negative vibrations from spaces, begin ritual and call guides and spirits. Bells are often used throughout the world to remove negative spirits or energies from homes by ringing them regularly through rooms, even into the corners. They have also been used to call the fae and elemental guides.